I know this is not about me but, just between us, this is not the easiest job in the world. Not only do you have to show up for an assignment suffering from the mother of all summer colds but what do you write about a show that is given a splendid production while, at heart, is not very good? I guess you just have to blow your nose and come right out and say it. Gilbert and Sullivan’s “Iolanthe” is not at the top of the famed composing team’s considerable heap. Although the title character and her friends, being fairies, are ageless – the plot, slim to begin with – has not stood the test of time. On the other hand, the lavish, beautifully performed Lamplighters production touring around the Bay Area this month has nary a flaw and goes a long way toward redeeming this silly spectacle. The music is good, although essentially lacking in the “blockbuster” songs that enliven “The Mikado” and “HMS Pinafore.” This is apparent from the first notes of the overture, and Baker Peeples’ orchestra, though small (as it must have been back in 1882) does it proud. And this venerable, largely volunteer, troupe has mustered the voices to sing it well, beginning with the title character, performed by Molly Mahoney on August 3 (the leading roles have been double-cast, due to the performance schedule). Elena Galvan and John Melis make a good-looking pair of blighted lovers and Sonia Gariaeff an hilarious and commanding Fairy Queen. Robby Stafford delivers a strong-voiced, very funny, snobbish peer, suitor for the ingénue’s hand and, saving the best for the last, F. Lawrence Ewing (who also choreographed) is an absolutely fabulous Lord Chancellor, throughout, and particularly in his showpiece “patter songs,” “When I went to the bar” and the Nightmare soliloquy. The costumes, by John Gilkerson, Christina Weiland, William S. Jones and Melissa Wortman, are outstanding — filmy gossamer creations for the fairies and ermine-trimmed capes for the parliamentarians – as are the striking sets, enchanting woodland for Act I and a charming, quirky Parliament Square for Act II, by Jean-Francois Revon. It’s all good, as they say. But the story – don’t ask. The Queen of the Fairies (Gariaeff) has exiled a beloved member of the band for marrying a mere mortal, which fairy – Iolanthe – has given birth to a son, the shepherd Strephon, now 24 and madly in love. But the course of true love never did run smooth, especially in a G&S operetta, and the object of his affection, Phyllis, a Ward in Chancery, also is coveted by her guardian, the Lord Chancellor, and the entire House of Peers. Got that? OK, what follows is the usual mash up of lovers and rivals and mistaken identities and last-minute-revelations-that-save-the-day that we have seen before – and better. Gilbert and Sullivan used their plots to skewer a lot of the institutions of their time and “Iolanthe” is no exception, focusing its barbs on class distinction (see “Pinafore”), snobbishness (reference “Mikado”) and politics (probably all of them). This one, however, takes particular aim at the House of Lords and, rumor has it, Queen Victoria was not at all pleased. But the sight of the excellent Lamplighters male chorus, sneering in a lordly manner, marching in to “Loudly let the trumpet bray,” is totally worth incurring a little royal wrath. 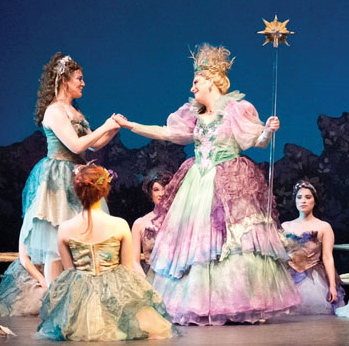 “Iolanthe” is a mixed bag. But the Lamplighters manage to pull some moments to treasure from amidst the junk, raising dumpster diving to the level of an art.